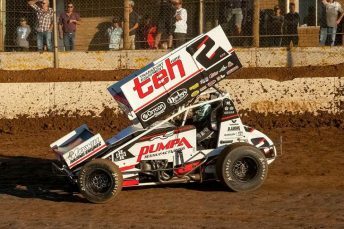 Despite experiencing a mixture of fortunes throughout the opening rounds of the 2017-18 season World Series Sprintcars Championship over the Christmas-New Year period, the Krikke Motorsport team and their driver Jamie Veal managed to turn things around with an encouraging result in the fifth round. Travelling to his home track Warrnambool’s Premier Speedway last night, Veal showed good pace aboard the WA # 2 Transport Equipment Hire / Pumpa Manufacturing supported Maxim car from the outset, recording the fourth fastest lap in Flight 1 of qualifying time trials, before powering from ninth to second in his opening heat race and finishing fifth in heat-race two. Starting from the inside of the second row for the 30-lap feature race, after he had placed third in the Silver Shootout, Veal made his way into the runner-up spot in the opening five laps, before in the latter stages launching a successful attack on Kerry Madsen for the lead, only to be forced back to second when the yellow lights came on and then going on to have to settle for the runner-up spot. This result came off the back of a 14th-place finish in the opening round at Murray Bridge Speedway in South Australia after an unfortunate spin while battling for a top-five spot, followed by a disappointing DNS in the following night’s feature race, also at Murray Bridge Speedway, due to an electrical issue. Veal and the team then travelled to Mount Gambier’s Borderline Speedway where they qualified third for the feature race, but recorded a DNF after being involved in an opening lap spin, which saw them sent rear of field before later retiring to the infield. In the fourth round at Geelong’s Avalon Raceway, a flat left-rear tyre and subsequent DNF in his opening heat race put Veal in the Bronze Shootout where he finished seventh, going on to place fifth in the feature race. Veal, who now sits fourth in the current WSS Championship point standings after five completed rounds, was pleased to finish the Speedweek Series with a podium result. “Despite our backs being against the wall, our dedicated team has never stopped trying and the morale amongst the team has never been down,” enthused Veal. “It’s been a pretty unlucky start to our World Series campaign, but one thing is for sure we have great pace and that’s never been an issue. The Krikke Motorsport team will now set their sights on tomorrow night’s sixth World Series Sprintcars Championship round at Brisbane’s Archerfield Speedway in Queensland, where they will be hoping to bank some more valuable points. Following that, they will return to Archerfield Speedway for the seventh round on Friday and Saturday night, which will double as the annual Australian Open.